33 out of 35 (94.29%) customers would recommend this product to a friend. I have purchased many toner cartridges from Ink Technology and I have never had a poor performing product. Delivery is always fast. Great Price and Great Customer Service! I had order my Brother's Compatible toner for a great price and chose the 1-4 day shipping for free. I received it in two days. Could not tell the difference in quality from my Brothers toner before and this one. Excellent Product, will continue to order future items from Inktechnologies. I saved so much money by ordering my toner from Ink Technologies. The quality of the printing is just as good as the name brand. I would buy again for my ink and toner needs. This fit fine into my Brother HL-5340D. The compatibility checker was unsure. Just be sure you have the carrier. This is an insert for it. If you're printer was running before the ink ran out, you have the carrier. You just press a blue plastic tab to remove the old exhausted ink cartridge, and replace it with this. Takes about 3 seconds. The print quality is as good as any I've ever used. Why pay over $100 for a manufacturer's replacement? No problems! Love it! I will be recommending! I have not been the one to replace this before so I was unsure of how to do it. The kind person on the phone helped me buy the right product and also explained clearly how to put it in. Excellent product. Price is great and it prints as many copies as it says it will. The product was priced right and it was shipped for free. It came in a timely fashion. Solid product, very good value, easy ordering and quick delivery. Would buy again. Great product, great price. Delivered as promised. I buy this product all the time. I have excellent results with it. I would recommend to anyone who has needs this ink cartridge. We got this toner thru a special promotion just to check out quality and see how long it would last. All in the office are very happy. Lasting longer than other products. Great value!! Love the toner. It prints clearly and was a great price. I will order from you again and would recommend you to anyone. Great product, great price. I always use it. I have not used the product for long, but so far have had no issues, I am waiting to see how many printed sheets I get out of the toner. Once we put in the replacement cartridge we were back up printing and providing clear, clean, and high quality reports. What a savings! This product met and surpassed expectations. I'll order this again. This is a great product, no problems, would buy again with no concerns. Great product i keep coming back and I would recommend this to everyone. I am very pleased with the print quality of these toner cartridges. I have saved so much money using Ink Technologies and the product is as good as any OEM product. I have only had to return anything once and I got my replacement in 2 days! I think it's a good product. I could recommend this product to a friend. Every time I order ink, my order is delivered quickly for a great price and I never have any problem using the product. I highly recommend Ink Technologies. The toner cartridges are generally just as good as Brother's originals. Sometimes they have a little extra toner dust when first opened, but work just fine. I've been buying them for years to save money on printing expenses. I was very pleased with my purchase as always. I love the fact that I get quality printer supplies at very reasonable rates. Always a pleasure. I purchased this cartridge on 9/20/2014. I honestly had some trepidations about purchasing a "compatible" part but I've experienced no issues with this toner and it's performing as advertised. The HP admin page giving life left corroborates the life this cartridge is supposed to have so far. I'm very pleased. This ink toner was worth the price and I am happy with my purchase. Excellent service, will buy again. Always great and fast service. Prints well with great price! I have no dislikes about this product. Toner is good quality and best price for this product!!! Very economical product compared to name brand. This is equal in print quality and quantity. Volume discounts allow even more savings. A video covering the new compatible TN650 toner cartridge, which replaces the original OEM Brother TN650 cartridge, including installation instructions. 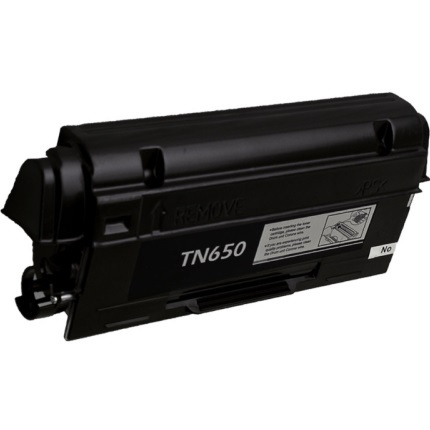 The TN650 is a black toner cartridge with an impressive yield of around 8,000 pages, based on 5% page coverage. It weighs around 2.4 pounds, and measures 14.3 by 7.8 inches, making it fairly easy to install. Start by unpacking your new TN650 cartridge and removing it from the box and packing materials. Rock the cartridge back and forth to help distribute the toner inside more evenly. You can then pry the plastic cover from one side and remove it. Press the button at the center of the printer to release the access panel and pull it downward. You can now grab the drum and cartridge assembly and remove it. Lay down some paper to protect against spills and set the assembly on it. Press a small lever on the side to release the cartridge from the assembly, then lift it up and out. Insert the new TN650 toner cartridge into the assembly with the front downward, then lock it into place. Turn the entire assembly around and clean the corona wire by sliding the small tab across the surface a few times. Make sure to lock it back into its starting position when you are finished. Slide the entire TN650 cartridge and drum assembly into the printer, pressing firmly to make sure it is fully inserted, then close the access panel. The Brother TN650 toner cartridge is compatible with a large number of Brother models, including personal laser copiers in the DCP-8050 series, compact printers in the HL-5340 through HL-5380 series, and multifunction models in the MFC-8370 through MFC-8890 series. For a complete list of Brother TN650 compatible printers, see the “Fits Printer Models” tab.